Download Vectir latest version Free and control your PC or computer with your mobile phone. It is a computer application that allows you to control some of your computer programs from your Mobile Phone. This idea is very amazing that is now possible with the help of Vectir Free. Vectir Free has some features locked and can be purchased. Vectir Free is very easy to install. There are two steps to work with Vectir application, 1st is to install computer software known as Server on your PC and then install Vectir Remote according to your mobile phone device. 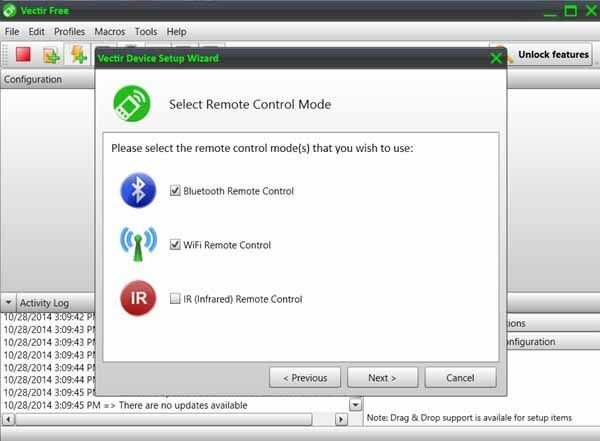 Vectir Remote is available for Android, Windows mobile, Black Berry and Java phones. Remember that, your mobile phone must have bluetooth or WiFi or Infrared. If your mobile have any of this connection, you can use your mobile phone as remote for your PC. After installing the application on both sides (PC and Mobile), you are ready to connect your mobile to control the application. When you start the program on your PC, it will start with wizard. Start it and continue, then select the connection types you want to use. There are three and you can select all to use in future. Then it will show you the plugin that can be control from your mobile. You must install VLC, Winamp, spotify, PowerPoint, Windows Media Player. After that, open the Vectir Remote from your mobile and then select the connection option. Make sure your bluetooth, wifi or infrared is enabled at both sides (Mobile and PC). When connection successful, you will see the applications. If you select any application, it will start on your PC automatically.